The venue is basically a food court. It will be held there. Ini adalah Jogja Mini Competition yang ke empat yang diadakan setiap tahunnya di Jogjakarta. Seluruh peserta akan mendapatkan sertifikat partisipasi, dan pemenang akan mendapatkan sertifikat saja (tanpa medali). This is the fourth Jogja Mini Competition that held every year in Jogjakarta. All of the competitors will get participation certificate, and the winner would get certificate only (no medallion). The time limit for all event is 10 minutes. 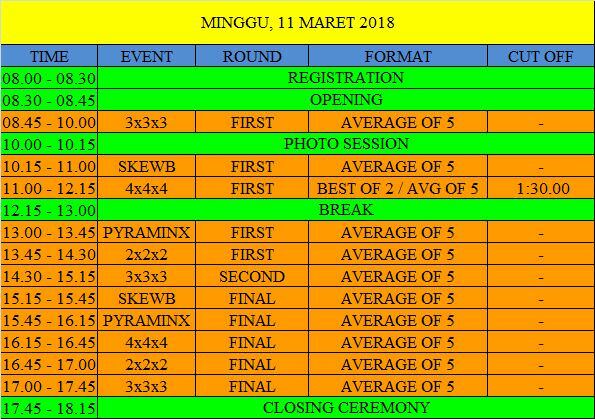 The second round of 3x3 will be reserved for 50% competitors from previous round..
All final round will be reserved for top 8 competitors from previous round.